You know your family has been using the same funeral home too long when you call and they know who you are. "Oh honey you sound terrible, take care of yourself. Go back to bed." I'm still sick as a dog, this isn't right. Went shopping with mom for funeral clothes and spent $30 at Wal-mart on ginger ale and various cold remedies. 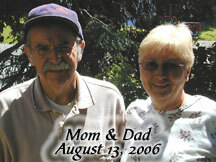 The obituary is in the paper and online at the funeral home. 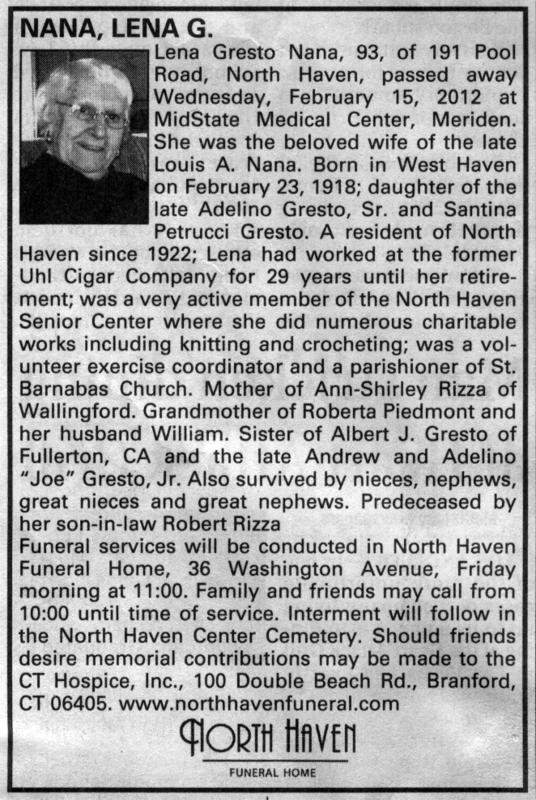 Lena Gresto Nana, 93, of 191 Pool Road, North Haven, passed away Wednesday, February 15, 2012 at MidState Medical Center, Meriden. She was the beloved wife of the late Louis A. Nana. 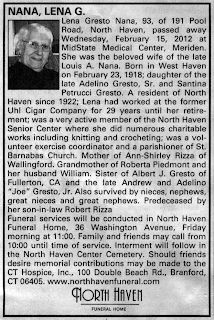 Born in West Haven on February 23, 1918; daughter of the late Adelino Gresto, Sr. and Santina Petrucci Gresto. A resident of North Haven since 1922; Lena had worked at the former Uhl Cigar Company for 29 years until her retirement; was a very active member of the North Haven Senior Center where she did numerous charitable works including knitting and crocheting; was a volunteer exercise coordinator and a parishioner of St. Barnabas Church. Mother of Ann-Shirley Rizza of Wallingford. Grandmother of Roberta Piedmont and her husband William. Sister of Albert J. Gresto of Fullerton, CA and the late Andrew and Adelino “Joe” Gresto, Jr. Also survived by nieces, nephews, great nieces and great nephews. Predeceased by her son-in-law Robert Rizza Funeral services will be conducted in North Haven Funeral Home, 36 Washington Avenue, Friday morning at 11:00. Family and friends may call from 10:00 until time of service. Interment will follow in the North Haven Center Cemetery. Should friends desire memorial contributions may be made to the CT Hospice, Inc., 100 Double Beach Rd., Branford, CT 06405. We don't know if she would have changed the hospice donation to Alzheimer's in honor of my dad, so we left it as is; the assumption is that she was thinking of my grandpa (who died of cancer and hospice came to the house and helped care for him as he died)--she designed her obituary in 1997. Honestly, make a donation to either if you wish, they both do good things for sick people. Tomorrow at this time we'll be at the restaurant eating and remembering Grandma and it will all be over.